A couple weeks ago I got note home from school that my kids' classes desperately needed donations for the baskets that their classes were putting together. Apparently the school does a fundraiser where the classes collect items for themed baskets and then they are raffled off. I had completely missed any information that came home about donating, but I didn't have anything pressing on the agenda so I decided to donate quilts. For my daughter's class, they were collecting items related to reading - books, hot cocoa, mugs, and snuggly blankets. That was easy, I donated this quilt. But my son's class wanted outdoor items - kites, soccer balls, picnic items, etc. I didn't have a picnic quilt on hand - I had only made one and it's the one that we use - so I decided to make one. We have really enjoyed the picnic quilt that I made for my family so I knew I wanted to make this one the same way and I thought I'd share my process with you. 1. I cut a bunch of 5" blue, green, and gray squares from my stash and pieced them together. Obviously you can make the quilt top however you want, but that's how I made this quilt top. 2. Use canvas for the backing. I used an Art Gallery Fabrics canvas print which is great because their canvas is pretty heavy duty, but there are lots of canvas options out there. If you use a wide canvas like this one (it is 58" wide) and your quilt is less than 50 inches wide (and you line up the layers very carefully when you baste), the width of the fabric should be wide enough to just need 2 yards for the backing. 3. Use flannel for the batting. In the first picnic quilt I made I used a flannel sheet (prewashed!) which worked great. I didn't have one on hand this time, but I did have lots of random flannel scraps so I pieced them together. Since some of the flannel pieces were really colorful and I didn't want to be able to see them through the quilt top, I put the right side of the fabric down when I basted the quilt. The pieced scraps worked really well. 4. Tie the quilt. This isn't necessary, but it just feels like a picnic quilt should be tied. I tied mine with Perle cotton and placed a tie at each seam intersection. 5. Use a wide, fold-over binding. If you have never used this method, Allison has a great tutorial. I did my binding just like the tutorial with a couple of exceptions. I like to make the binding extra wide because it adds weight to the edges of the quilt which helps weigh the quilt down so it isn't blowing up in the wind or getting shifted around. Instead of trimming the backing down to 1" around the edges, I trimmed it down to 4". I also trimmed the flannel batting to be the same size as the backing, not the quilt top. That adds even more weight to the thick binding. 6. Zig zag stitch the binding into place once folded over. I have tried hand stitching this, but it is really thick so it was quite laborious. 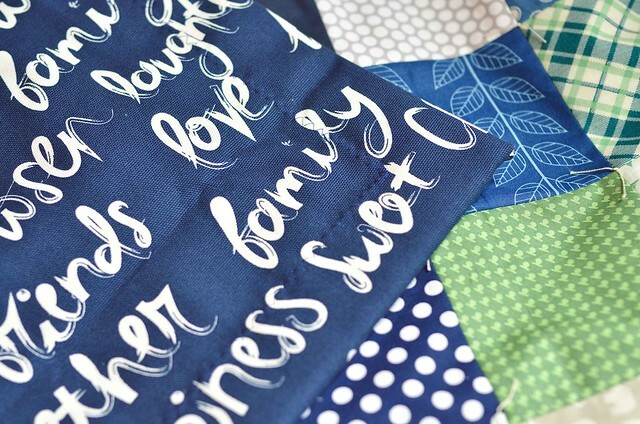 Using a zig zag stitch leaves a smooth transition between the quilt and the binding and is quick and easy. It should also hold up well to repeated washing. This was a pretty quick turnaround, I made it in a little over 2 days without much stress, so it is a pretty fast project. My son was happy to donate it to his classroom basket. 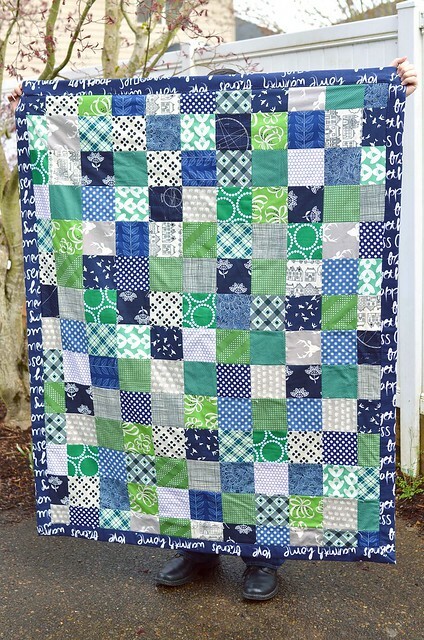 Such a beautiful quilt - love the blue, green and gray together and using flannel for the batting with the extra wide binding. A special gift!! Thanks! I think flannel as batting is perfect because it keeps the quilt from being bulky and makes it much easier to carry around. What great timing to see your picnic quilt! I've started a large one for our family but was struggling with the very issues you answered here (what to use for batting and backing). I'm also going to look at Allison's binding technique. Great, I hope it helps! 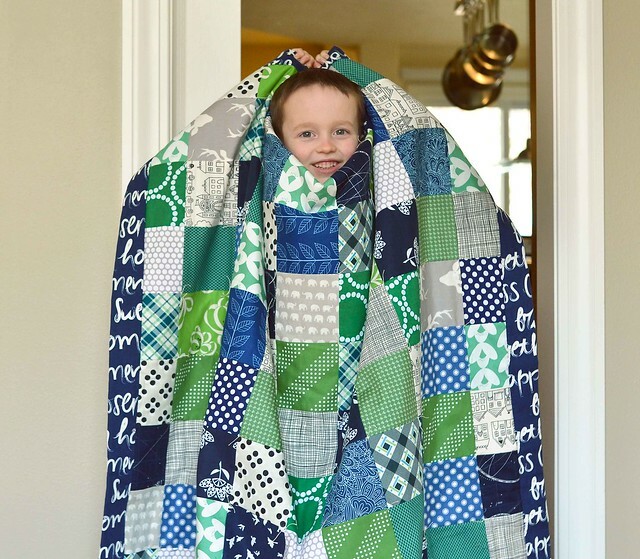 Good luck with your own quilt! This is so cute. I'm a sucker for those colors, too. 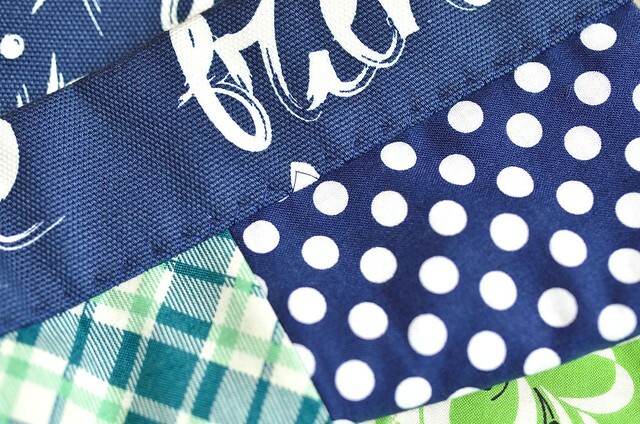 I don't have a picnic quilt, and I need a new project. I just found it. Thanks for the great advice. I just came across you on Bloglovin'. I love the quilt and the quilt colors. You did a fantastic job. The canvas and flannel are great ideas. Such a pretty quilt! Thanks for sharing. I love the way you finished the picnic quilt. Beautiful quilt! Oh! MY! 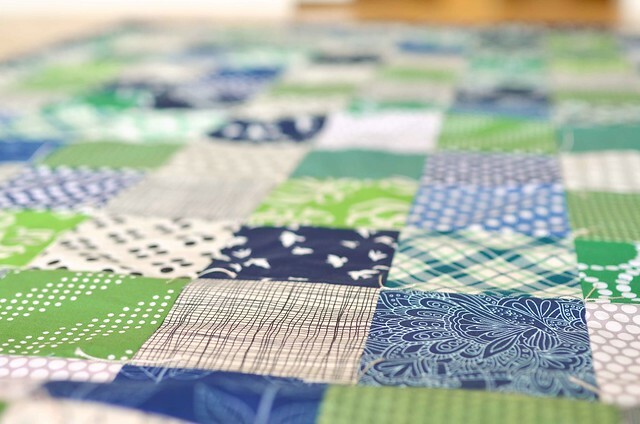 That is such a beautiful quilt - and THANK YOU for taking the time to 'splain it all here in this blog.............so many things to love about it (flannel batting, canvas backing, extra wide binding......all that without even mentioning the colors/scraps you have used!!) LOVE IT! Thanks! I put a lot of thought into constructing it so hopefully sharing it will be helpful! Love the colors and thanks for sharing! Awesome quilt!! I just discovered you on Bloglovin and I love all you make!! I can see your point about the wide wrap around binding holding down the edges a bit. Maybe I'll do that next time! It really helps keep the quilt from blowing up in the wind or kids from shifting the quilt around. There are 7 more days of school (not counting weekends) and this summer I plan on spending lots of quality time with my kiddo going to parks and on adventures. I need one of these to keep in the car for those planned and impromptu picnics. Now only to finish up some other projects so I can make this. Thanks, as always, for the great tutorial!